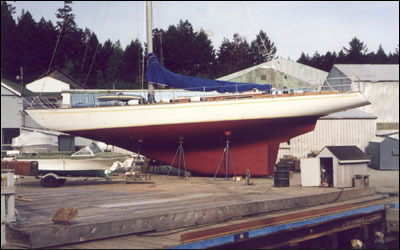 The Dame Pattie was a successful challenger for the 1967 Americas Cup, lost against the American defender Intrepid, New York Yacht Club. 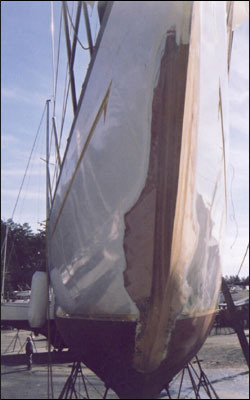 Designed for light airs typical off Rhode Island Sound, USA...unfortunately experienced heavy airs; cotton sails were not the match for the new USA Dupont Dacron technology. 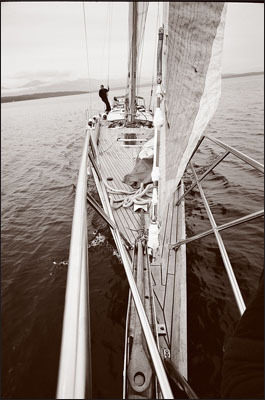 The hull is constructed of Douglas Fir from Vancouvrer Island, Stringers and clamps of spruce, deck cedar over beams of spruce, ribs of oak and laminated mahogany from Aus. 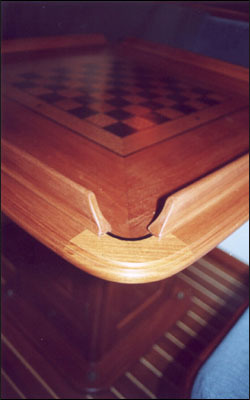 Main stem of mahogany. Addition of living quarters below performed in 1999. 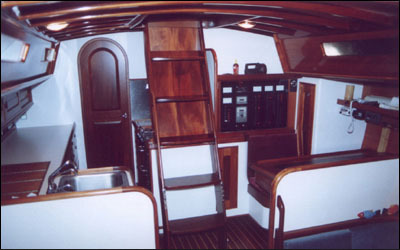 Detailed woodwork, galley design, chart table and finshing performed by Mark Wallace. My involvement in Dame Patie has been in finishing off a very attractive interior and the replacement of the stem. An unfortunate situation that might have been avoided with 5 cents worth of bedding compound.